Welcome to Dillon Toyota Lift's blog. Here you will find everything from product features, industry education, operator insights, material handling solutions, safety, trends, best practices and more! When you start looking to buy a forklift, one of the first things you will notice are the different tire types that are available. Pneumatic and cushion tires are the two most common, and those tire types are often used as a dividing line for the forklifts used in certain operations (along with fuel type) If your business operates a lot outdoors, then you may want to take a look at this post explaining pneumatic tires and why they are beneficial. But if you work mostly indoors, then cushion tires are made for you. To put it simply, cushion tires are made of a smooth rubber that is fitted around a metal band, great for indoor applications. The following are some of the major benefits of cushion tires. Cushion tires are designed specifically to work great on smooth surfaces, and the hard outer surface is designed to reduce chipping on the wheels. Cushion tires also contain more rubber, allowing for a safer, more comfortable ride for the operator. This extra rubber will also allow for a longer service life. But, using these types of tires outside on uneven terrain could cause early chipping, and could be a safety hazard due to the reduced traction of the cushion tires. While it is alright for you to use it on smooth asphalt outdoors, we recommend you limit the time you use them outside. Another reason cushion tires are great for indoor applications is that they allow for a more maneuverable forklift. They are able to fit a smaller forklift frame, and have a lower ground clearance. When you operate in a warehouse, having a smaller forklift is important when it comes to making the most of your space. This allows you to navigate narrower aisles, and keep your racking closer together. The more space you have for racking, the more product you can hold in your warehouse. Because cushion tires require less materials to produce, it is less expensive for companies to manufacture them. This is good for you, because they are usually cheaper than pneumatic tires. Another way cushion tires help you save money is by being easier to maintain. By making sure your warehouse floors are clear of debris, and not driving your forklift over tough terrain, you can help your cushion tires last. Make sure you do some research, and really look into all of the different uses the forklift could get in order to make an informed decision. Once you choose a specific forklift and its tire type, I highly recommended against changing tire type on your forklift (and it’s often impossible to do so). Warehouse receiving areas are some of the busiest places in a supply chain. Because of the variables involved with receiving such as unknown personnel (truck drivers) in your warehouse, the irregularity of goods received, and changing storage needs after product is received, this area in any operation can be very difficult to standardize. Amidst the controlled chaos of a receiving area, open dock doors that are not actively being used to unload a truck pose particular hazards for forklift operators and pedestrians. A lack of awareness of open dock doors can lead to dangerous situations that were more than likely preventable. Remembering a few important points about dock door safety might help increase safety while also maintaining as much efficiency as possible. As an Operator, You Might Easily Back Off of One if You’re Not Paying Attention. Even if you don’t see them in front of you, open dock doors are still there. It’s a major disaster if, in the middle of operating a forklift to handle material in the receiving area, an operator backs out an open door. Remember that awareness of what is behind you is key in maintaining dock door safety. Some dock levelers can be upgraded to automatically fold up into a protective barrier to help prevent the possibility of back off. As a Pedestrian, You Might Easily Fall Off of One if Proper Precautions Are Not Taken. OSHA standards require that wall opening with a drop of more than 4 feet must be chained off, roped off, or otherwise blocked off. If this precaution is not taken, distracted pedestrians might walk off open docks, potentially being harmed in the fall and being left vulnerable in a busy receiving area where trucks are moving in and out. While ropes or chains meet the OSHA requirement for block off, heavy duty safety barriers can also be purchased (many times from certified Toyota dealers). As a Pedestrian and Operator, You Might Easily Forget that Trucks Will Eventually Fill the Door. Dock doors are places where product is moved in quickly. Not every worker in an environment will know exactly when a truck will arrive. When working around a dock door, you must remember that semis are going to be pulling into those spaces, and drivers won’t always have the best visibility when backing in. Therefore, it is the responsibility of forklift operators and pedestrians to stand clear when a semi is arriving. Changing hydraulic fluid is a fairly simple task. However, we recommend a professional certified forklift technician perform the task. Toyota certified technicians are trained on all make and models of forklifts. If you’ve been at your business for a while, you can usually predict when busy seasons are going to strike. Advancements in supply chain forecasting measures have made it easier than ever to plan ahead for seasonality. And while you may feel prepared to meet demands, all businesses are subject to conditions and circumstances beyond their control. Say you didn’t anticipate the popularity of a new product that was released. You may not have ever needed to handle this new volume of orders for this particular product. On the other hand, say you released a product during a holiday that turned out to have an incredibly high return rate. You’re now unprepared for the stress on the reverse supply chain when orders are returned in larger volumes than predicted. And while both of these situations can happen and can mess with your inventory projections and needs, you also have to consider the possibility of equipment breakdown. On deadline in the peak seasons, having an important piece of pallet moving equipment go down can be devastating to delivering products to customers in line with your promises. I actually recommend you keep some backup equipment on hand to combat these possibilities. But whatever the circumstances, these unexpected turns can leave you in a position where you simply don’t have enough equipment available in your warehouse or distribution center to keep the products moving. You need additional material handling equipment that you can get quickly and without hassle. Keeping a large inventory of spare parts on hand encroaches on both the budget and physical storage space of your business. What happens if your forklift goes down and you don’t have that critical spare part on hand? Your business suffers unnecessary downtime and you may be forced to pay outrageous freight costs to have the parts shipped to you overnight. How do you determine which forklift parts are critical and which are not? What parts do you purchase most often? This should be your first consideration, especially if you have a fleet of several forklifts. Look back and determine which parts have been consistently replaced in the last few years and keep them in your on-site inventory. If your forklift goes down, how quickly will you need the part? If you will need it immediately, then it is a critical part. If you have a backup forklift that can be used or another means of covering the downtime, then it would not be a critical part. Will your business be halted or delayed if you don’t have the part? If the answer is yes to this question, then it is a critical part and must be kept in inventory. How long will it take you to receive a part if ordered? Find out which parts your local Toyota Forklifts dealer keeps on hand and which ones have to be ordered. Doing so will help you determine how long it will take you to retrieve the new part. If you need to have a part repaired, what is the average time it will take for your dealership to make the repair and have it returned? Contact your dealer and determine average repair times for those parts that you define as critical. If you don’t have space for a large inventory of spare parts, work with Dillon Toyota Lift to make sure they have the parts on hand that are critical to your organization. Keep a list of those critical parts posted so your technicians know what steps to take to procure that part. If you are going to experience a lengthy downtime, will your dealer be able to provide a loaner? By being prepared and determining which parts are critical, your business could save money and most importantly, time. Using forklifts effectively in any application requires assessing how they will work in concert with the other elements of your facility. 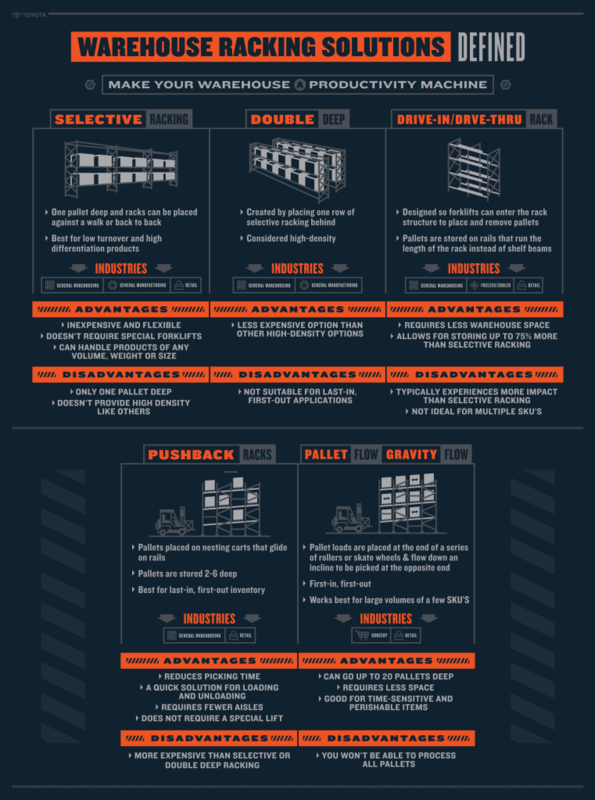 From understanding your dock capabilities to making sure pallet racks and forklifts match up appropriately, a successful facility takes into account every touchpoint of forklifts in use. An easy to overlook touchpoint that requires attention is facility flooring. Too often, operations that use forklifts experience unexpected damage to both product and equipment because floors become damaged. In this post, I’ll discuss some of the impacts of damaged floors on equipment and personnel, help identify some trouble areas on concrete floors, and discuss possible solutions to damaged flooring. The thing about forklifts? They’re aren’t equipped with the suspension system of a luxury SUV. When you roll over a bump while driving a forklift, you’re going to feel it. And while Toyota forklifts are ergonomically designed for operators’ optimal comfort, a floor that’s fallen into disrepair will place stress and strain on an operators’ body. Maintaining a floor inspection schedule is key to preventing damage. But if you’re an operator and you see or feel floor damage, make sure your report it. Most forklifts that operate indoors will have cushion tires, and cushion tires are not manufactured to withstand uneven terrain. Uneven terrain includes flooring surfaces where chunks of floor are missing or general rough patches are present. When you continually drive cushion tires on a damaged floor, you’re likely to shorten the intervals between necessary tire replacement, placing strain on the forklift and on your budget. Damaged floors might also be hazardous for the products you’re moving. Not only will driving over damaged floors cause less than optimal work conditions for your operators, it increases the risk of product spills if items fall from pallets due to traveling over the uneven terrain. Even something as seemingly negligible as increased vibration of products on a pallet can damage certain types of materials. Making sure your floors receive optimal care helps protect your investment in the product. An even bigger investment might be your forklifts; those capital investments need protection, too. Forklifts are designed to have a low center of gravity, so there are many points on a forklift such as under the mast and chassis where under clearance is minimal. If a clearance assessment was made prior to acquiring the forklift, this may have been done prior to any flooring damage. Should floors later become damaged, you might not have the necessary clearance, potentially increasing impacts on the forklift. Such sudden impacts caused by poor flooring conditions can also damage internal forklift components over time, potentially causing a forklift to become unstable. One helpful preventive measure? Toyota’s T-matics solution can be installed on most Toyota equipment to monitor for impacts and assess where they occur. If there is damaged floor where impacts are occurring often, T-matics might be able to help you identify the problem. Performing a regular visual inspection of your floors is highly recommended. One main problem area that requires frequent inspection are the joints between concrete slabs. Because these are inherent weak points in the floor and receive pull away pressure from the weight of forklifts, they are likely to be the first places that fall into disrepair from natural wear and tear. Replacing concrete joints when they become damaged might seem like a costly investment. However, the long-term ROI of less forklift repair and more efficient operations makes the investment worthwhile. The condition of your concrete floors goes even beyond the damage that they undergo due to wear and tear. You must also consider how friction plays a role in several critical forklift functions. When floors are wet or slick due to spills or chemicals that are used, it reduces the friction of the tire surface with the ground. This can have a significant impact on a forklift’s ability to stop or accelerate effectively, which can be an eminent safety hazard. It is imperative that floor surfaces are cleaned properly and allowed to dry before attempting to drive over them. Ensuring that the floor is also free of debris and any obstructions will help to avoid potentially unsafe driving situations. Be sure to thoroughly read and understand your forklift’s operator manual for more information regarding proper floor conditions for your particular piece of equipment. Whatever you plan strategically to make sure your floors stay in top condition, having an inspection plan in place is key to success. Material handling investments work hand in hand with facility investments, right from the ground up. ProMat is the premiere event for material handling leaders, where the best operations are seeking innovative solutions from fellow experts in the field. It’s the forefront of the industry’s future. Toyota Material Handling has evolved from its roots to meet diverse challenges and adapt to the market. At ProMat 2019, we’re introducing more than the next evolution of forklifts. We’re starting a revolution of the way you think about material handling solutions. When you visit TMHU at ProMat, you’ll see what next level innovation is all about. Chicago is the exciting location of ProMat 2019! Toyota Material Handling wants to help as you make plans and book travel accommodations in the Windy City. Follow the link below to locate the ProMat Expo’s official travel recommendations and information. And while you’re at the show, come see Toyota Material Handling at booths S1003 or S603 and receive a free gift! Selective racking systems are some of the most common and widely used racking systems, mainly because they are less expensive and easier to install than other, more specialized racking systems. Selective racking is great for warehouses that store a large amount of stock keeping units (SKUs). Selective pallet racking is usually a single-deep pallet rack. This type of racking makes any given pallet in the rack system accessible without having to move another pallet. Cantilever Racking systems are used to store items that cannot be easily stored on pallets. Warehouses that use cantilever rack, usually store longer and heavier items to be stored horizontally across multiple arms (like lumber or steel pipes). Pallet racks, on the other hand, have vertical uprights that limit the length of stored items. This is the primary difference between cantilever racking and pallet racking. Pallet flow racking systems are also referred to as “gravity flow” racking systems. Pallet flow racking systems are best suited for the first-in, first-out (FIFO) inventory management methodology. When you load a pallet from the loading aisle and onto the lane rollers, gravity allows the pallet to roll to the front of the system. When the pallet is removed from the front of the racking system, the pallets behind roll to the front of the lane. Pallet flow racking allows for high-density storage while maintaining FIFO. Some pallet flow racking systems may hold up to 20 pallets deep in one lane, minimizing the number of aisles needed to store items while maintaining efficient inventory turnover. Push back racking systems is another high density storage option, with the ability to store up to six pallets deep on either side of an aisle. There are usually three carts stacked on top of each other. The first pallet is loaded from the front in a push back racking system and sits on the top cart. When the second pallet is loaded, it pushes the top cart with the first pallet back. Push back racking gives you higher density storage than selective racking systems, while allowing you more selectivity with storing items than other types of racking, meaning you can store more SKUs. Drive-In racking systems are great for storing large volumes of just a few SKUs and can also be configured to manage inventory with FIFO or last-in, first-out (LIFO). With drive-in racking, the forklift literally drives into the racking system to move a pallet. This type of pallet racking system is cost effective by maximizing the amount of storage space in your warehouse. Choosing between these types of racking systems will depend on the various goals of your operation and the relevant inventory data like volume and throughput. No matter your decision, always be sure that this racking is installed safely and effectively to increase productivity. Dillon Toyota Lift's Warehouse Solutions team is here to help from start to finish. What Else Does Dillon Toyota Lift Sell? It’s a given – Dillon Toyota Lift has you covered when it comes to forklifts. But did you know we also offer racking, dock equipment, cleaning equipment, scissor lifts, batteries, and attachments? That’s right – DTL is your full solutions provider for everything material handling, including warehouse design! Do you need to set up a new warehouse or better utilize your current space? Dillon Toyota Lift's Warehouse Solutions team can provide project design and layout, seismic engineering, permit application/approval, and more. Not only that, we can purchase the racking and warehouse systems, and manage the installation process. Leave it to our in-house Warehouse Solutions team to figure out just what you need. Does your warehouse or facility need a good cleaning? DTL also offers a full-line of Advance Industrial Cleaning Equipment that includes sweepers, scrubbers, sweeper-scrubbers and wet/dry vacs. Do you need more space in your facility? Dillon Toyota Lift also offers mezzanies. Mezzanines can create additional space for a variey of different uses from storage to extra office space. As you can see, Dillon Toyota Lift has specialties that extend beyond the #1 selling forklift (Toyota). If we can’t provide a solution, we can point you to an expert. So, the next time you need something unique for your facility or business, contact Dillon Toyota Lift! When inventor Sakichi Toyoda successfully pioneered the automatic loom, he laid the foundation for Toyota Industries and our commitment to kaizen, continuous improvement. For nearly a century, the Toyota name has been synonymous with excellence in quality and innovation with the inventor’s spirit at the heart of our business. It took only eight years after establishing Toyoda Automatic Loom Works Co., Ltd. – known today as Toyota Industries Corporation – before Toyota produced its first engine in 1934: The A-type engine for automobiles. But I’m sure if you’re reading this blog you know that Toyota makes much more than cars. In 1956, Toyota began producing forklift engines, a new chapter in the story of Toyota Industries. As material handling needs evolved, so did Toyota’s role in the game. Heavy duty applications called for equipment tough and robust enough to take on high capacity needs. And at the core of these powerful workhorses needed to be an engine with the durability and grit to deliver reliable life and power. In 1986, Toyota introduced a forklift engine that could take on these heavy-duty challenges: The 4Y industrial engine. Carefully designed and engineered through the core practices of the Toyota Production System, this engine set a new standard of excellence within the material handling industry. Today, millions of these engines have been produced and can be found in forklifts, compressors, gas heat pumps, and more. But most important, these engines are at the heart of Toyota’s internal combustion forklifts, making them some of the most dependable pieces of equipment on the market. Don’t believe me? The 4Y Engine has helped Toyota forklifts achieve more than 35,000 life cycle operator hours with ease. Some have even reached over 80,000 hours. It’s an engine that is built to perform, but also engineered with sustainability in mind. The 4Y engine’s emissions system filters carbon monoxide, hydrocarbon, and nitrogen oxide gases, allowing it to surpass federal EPA emission standards. The 4Y engine is a testament to Toyota’s commitment to the pursuit of improvement and of its dedication to creating a more sustainable future. Want to learn more about the 4Y engine? Check out this video on 4Y’s perks and history or this video about how the 4Y improves Toyota forklift operation.